First of all, what and how does the term ‘White Paper‘ apply. The definition is: A white paper is a short authoritative guide or a report that’s oriented towards addressing as well as solving a particular problem or issue. White papers can be used to assist people in making a decision, or just to educate them. They are usually requested when addressing or discussing specific policy, technical issues or business fields. Commercially, white papers come into play when describing documents that’s used by marketers or businesses as a ‘soft’ selling tool. So white papers are for those who are looking for further detailed information on concise solutions, trends, or an explanation on new technologies. These topics are the best audiences when developing a content marketing strategy. So think of white papers as nothing more than a highly focused and strategic means to further persuade a consumer to nudge them subtly towards making a purchase. This is done by proposing a documented solution to a problem, and the solution being your product or service. This is perhaps where a lot of content publishers may have a problem. Writers as well as content development personnel must directly tailor the information that they write towards a specific researched audience. They must know exactly what their needs are and then address these concerns, which should satisfy their query. They want to help their prospect glide down the sales funnel towards a sale. This for marketers is and always should be the end game. White papers, when all said and done, are not really more complicated to create or distribute than any other type of medium. Being as subtle as possible is of paramount importance. Content developers writing white papers must be able to convincingly demonstrate their expertise and knowledge, while emphasizing the advantages of one solution over another one in a gentle convincing manner. What the reader expects is a detailed education in print, while being convinced that the right solution is presented, so that’s what must be delivered. To be able to do this most effectively, similar to other content development processes, you need to understand the target audience, as well as considering the time as well as the method of reading the content. Unfortunately, white papers will usually tend to be overly exhaustive reviews or become too technical, attempting to describe a method or trend and become more confusing than useful. The way that you can counteract this is to do diligent research, and then write engaging compelling overviews. Summaries as well as abstracts work rather well, and they can also be used in a variety of other content based marketing campaigns. More importantly, white papers should provide material that gives the buyer or a busy executive reason to jump to the end of paragraphs or to the conclusion, where you’re able to concisely describe how your product or service resolves the problem that is at hand. This ideally with expert testimonials and case studies. Due to their ease of dissemination, it’s always best to be able to keep the complexity level at a minimum. Industry jargon as well as strange acronyms will usually alienate readers and may inflict damage to a brand. So providing useful information and solutions using ‘everyday’ language is the solution, as well as securing long-term brand equity, which provides value to the consumer. So where should these white papers be distributed for optimum effect and what type of feedback should you expect once they’re consumed? White papers can be extremely powerful tools to build your product, brand or service, which expresses knowledge and expertise. But keep in mind they may not the best source of leads, at least when they are initially distributed. Often, consumers who read white papers are simply just looking for explanations as well as ideas, and their mindset is not to buy. When you time it properly, that’s when all that initial desired subliminal branding goes into effect. The goal of any white paper distribution should be when your potential consumer thinks of a product, or a solution to a problem, they will recall and refer back to your white paper for more answers to their problem. So the actual sales cycle at times can be long and tedious, particularly if you are selling higher priced items. So realizing your expectations when planning your marketing campaigns, may be the best course of action to take. 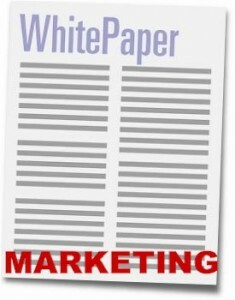 White papers should be distributed anywhere that your audience is or visiting. But that’s obviously easier said than done. The most optimal and logical place is your website or blog. Doing so allows you to control what type of information is collected, as well as being able to gauge buyer intent, or if they are just browsing. There are also a variety of excellent destinations on the Internet where your White Paper content can be freely shared. These distribution communities such as: SlideShare.com, Docstoc.com and Scribd.com, are a few of the most popular and most effective resources. Each of these services will enable you to upload your PDF documents, and then embedding them back to your site. Since the documents are hosted on their sites, bandwidth consumption is therefore reduced, while you being able to build your site’s online media center. For some, turning to Web destinations which are topically focused, with already established audiences is the most viable opportunity to distribute white paper content. Should your content be data driven or newsworthy, then approaching news or media portals for editorial coverage will give you optimum advantage. So go find sites where your industry decision makers or executives frequently gather, and then offer your expertise to them directly.